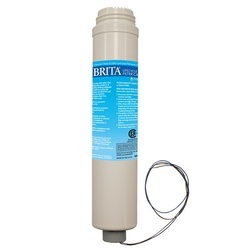 Model 6429 replacement filter is used on the Brita® Hydration Station®. It is a carbon block filter cartridge with a service life of 1 year/2,500 gallon (9463 L). Filter contains an on board chip to store total gallon usage; this chip interfaces with an electronic Lifecycle Control system to allow water flow only until the filter reaches its total gallon capacity.